9. 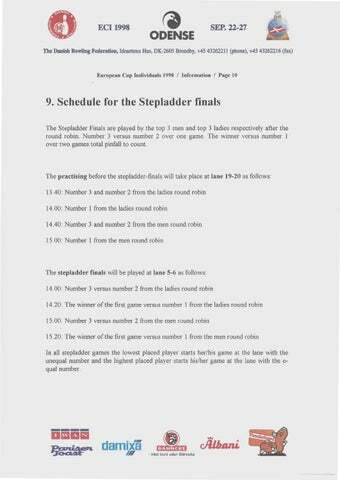 Schedule for the Stepladder finals The Stepladder Finals are played by the top 3 men and top 3 ladies respectively after the round robin. Number 3 versus number 2 over one game. The winner versus number 1 over two games total pinfall to count. 14.00: Number 3 versus number 2 from the ladies round robin 14.20: The winner ofthe first game versus number 1 from the ladies round robin 15.00: Number 3 versus number 2 from the men round robin 15.20: The winner ofthe first game versus number l from the men round robin In all stepladder games the lowest placed player starts her/his game at the lane with the unequal number and the highest placed player starts his/her game at the lane with the equal number.